This video from the Natural Resources Service in South Dakota points out the affects that grazing management can have on soils no matter where you live. This video by the Natural Resources Conservation Service in South Dakota does a great job of demonstrating that how we manage our livestock on pasture determines how sustainable we’ll be as farmers and ranchers. In an across-the-fence comparison using a simple water infiltration test, Jim Zimprich and Stan Boltz show the difference between a well managed, rotationally grazed pasture, and a pasture with a long history of season-long grazing. 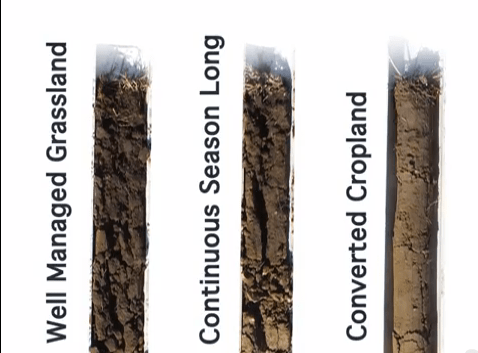 These soil cores show the changes in soil structure and the decreasing ability of soil to absorb moisture as above ground management changes. In this part of the world, it has been said that 150 – 200 pounds of production per acre is lost for every inch of water that isn’t absorbed. On a well-managed grassland, a spade full of soil reveals good granular structure which provides places for the water to seep into the soil. Good granularity also means grasslands with higher diversity and better overall palatability, and that maintain a higher plane of nutrition for a longer period in the growing season. Overgrazing on the other hand, either by overstocking or by grazing for too long a period, leads to compacted soil with horizontal layers that prevent water absorption. In their demonstration, one inch of water is absorbed into the well-managed pasture’s soil in just 10.1 seconds. Across the fence in the season-long grazed pasture, it takes the same inch of water 7 minutes and 3 seconds to absorb. Since some farmers are choosing to convert their grazing lands to corn production in South Dakota, they run the same infiltration test on grassland converted to cropland just 9 months earlier. It took 31.5 minutes for the inch of water to infiltrate. If you are reading this and thinking that, hey, I have sandy soil, so infiltration is not a problem, just remember that you want to have aggregation, too. The aggregation will help hold onto water that enters the soil so plants can take it up during dry periods. Is there a transcript somewhere? I’m having a really hard time understanding a lot of what he’s saying in the video, I think because of wind blowing into his microphone. I assumed you were talking about the second video. There isn’t a transcript. I think part of the problem is that he speaks really fast. I tried the auto close captioning but it came up with some really funny translations. Is there a particular part you’re having trouble with? If you give me the time code perhaps I can translate. Terrific clip! How timely. In much of the west, we are in our driest months and one can easily observe those areas of pasture or range that have been well managed by leaving some residue and adjusting timing of grazing. Folks need to see to believe and this infiltration demo is just the ticket! Soil type and plant species may vary but the principles are the same.